2009 started out as a very sad year when we had to say goodbye to our much loved little silver tabby Dylan, this was just a couple of years after his older sister a blue burmese, Cleo had passed away. It took us some time to decide to have another cat, but we soon realised how empty our home was without a special cat. After much discussion we both agreed it would be really nice to give a loving home to a rescue cat, then lots of research into different breeds and narrowed it down to either a Siamese or a Bengal. 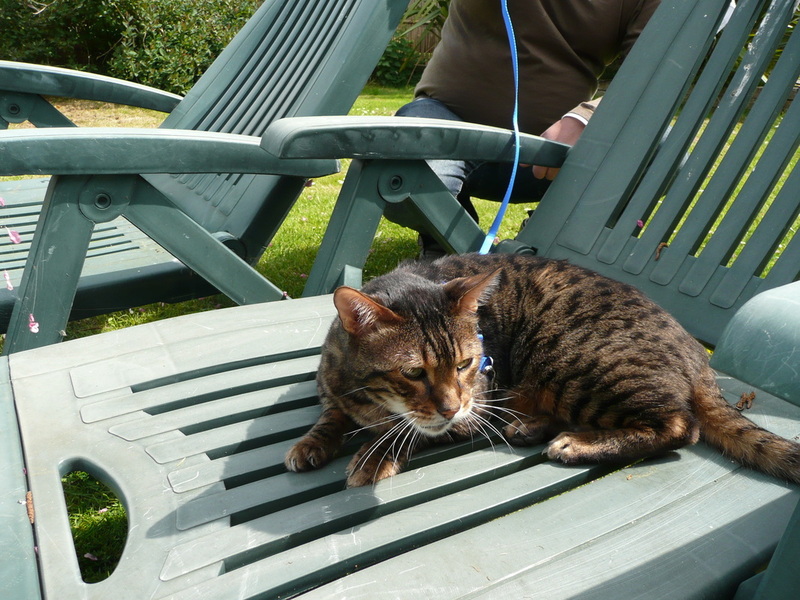 So we trawled the internet looking at different cat rescue’s and stumbled across this very cheeky looking 11 year old Bengal named Rupert at Wood Green Animal Sanctuary near Cambridge. We both fell in love with Rupert at first sight and when we actually met him, soon realised he was definitely the boy for us, very loving, really craving attention and so gentle. At this stage there was no way Rupert was not going to be part of our family, so we went to the office to find out more, we were told he could not go to a home with other cats or children, we got the full story when we asked why. It turned out that this was Ruperts second time at Wood Green. As a young cat he had left his first home and gone off on his travels, (I would love to know where) upon his return home 2 years later, his bed had another cat in it. Rupert could not get on with the new cat so poor Rupert was sent away to Wood Green for the first time. Upon finding his second home you would have thought this would have been the end of the story, unfortunately not. On this occasion after a few years there was a new addition to Ruperts life and his family was added to with a baby. The story goes that Rupert attacked the baby so he had to go, something that we and everyone who meets him find very difficult to believe. From the moment Rupert arrived in his new forever home with us he immediately settled in with a little explore, some food and then onto the sofa, from this moment onwards Rupert has had his spot between us on the sofa. We feel very lucky to have adopted Rupert who is now 18 and he is still a very special boy, that we both love very much. The first time that we went on Holiday after adopting Rupert, we felt really guilty leaving him in a cattery and hoped he understood that he had not been sent away again. So when we decided we wanted to set our own business up the choice was simple, “Point Clear Cattery”, where you can be sure your cat will get the love and attention that we would want Rupert, to get if he needed to stay in a cattery.